There's an old quote misattributed to Mark Twain that says it's not what you don't know that gets you into trouble, it's what you know that just ain't so. 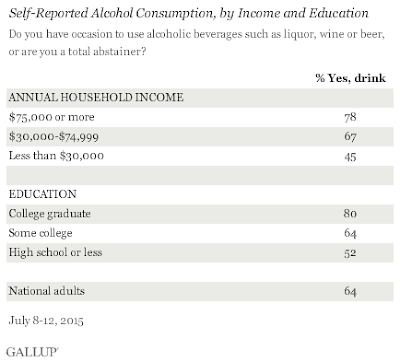 So when Gallup posted some findings on drinking patterns in the US, I clicked on through to see if it might disabuse me of any persistent old myths. One finding lined up pretty closely to what we expect: the rich drink wine, the middle-class drink beer, and poor drink (cheap) liquor*. There appear to be other factors here as well--education, race, and religiosity. Education is correlated with wealth, so it's not surprising that the educated drink more (that's the bit I clipped out of the first table). Religiosity leads one away from the devil's water. And the less-wealthy are more religious. 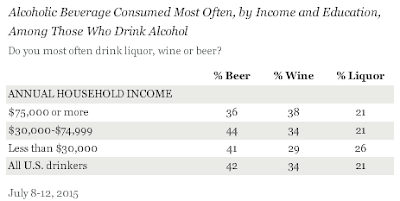 Drinking is also more common among whites (69%) than non-whites (52%), and among men (69%) than women (59%), but those factors are also both connected to wealth and religiosity--so all these variables are nested. Anyway, all you rich, white men out there--now we know what you're doing in your free time. *I condensed this table so as not to step on the big reveal later in the post. $75,000 a year annual household income makes you rich??? I find that astounding to be honest. 75K is wealthy comparatively. it's surprising what people can live on when forced to. And what happens if one is educated, religious (whatever that means) and non white? is that like the unicorn of beer drinkers? The fourth quintile runs from about 64k to 100k, so 75k puts you in about the top third. Is that wealthy? Well, good enough for this poll.